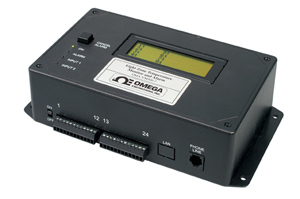 The OMA-VM500-7 and OMA-VM500-7-DCP dialers monitor power, 2 door status inputs and up to eight independent temperature zones and dials up to eight phone or pager numbers if the temperature in any zone goes out of limits, if there is a power outage or a door is opened. The integrated voice tells you which zone is out of limits and the current temperature. You can call the unit at any time to hear a report on the temperature of any zone, power status and door status. All programming is accomplished over the phone following simple voice instructions. These dialers are easily programmed over the phone. The optional Ethernet data collection package allows you to remotely check the dialer status with a standard web browser. Using this package you can view real time data, view historical data, automatically send alarm emails to key personnel that specify the exact location and cause of the problem, maintain secure data files, easily create and print graphs over specified time periods for any data and also program temperature limits remotely.